The lower loops provide easy access to Huzzah Creek, and the magnificent Red Bluffs the site is named after. These two hundred foot bluffs have been stained red by iron oxides leaching out of the rock layers at the top of the bluff. The lower loops are subject to occasional flooding after excessive rain. 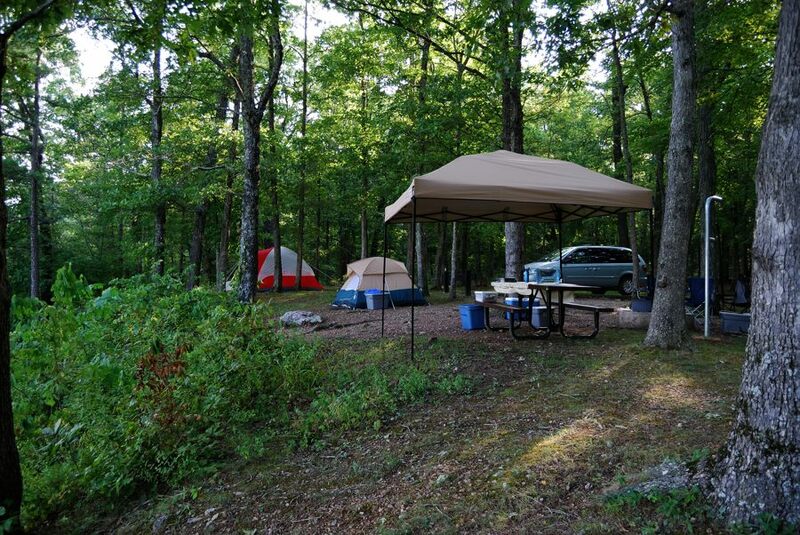 One of our favorite car camping spots in Missouri is in the Pines Overlook loop. 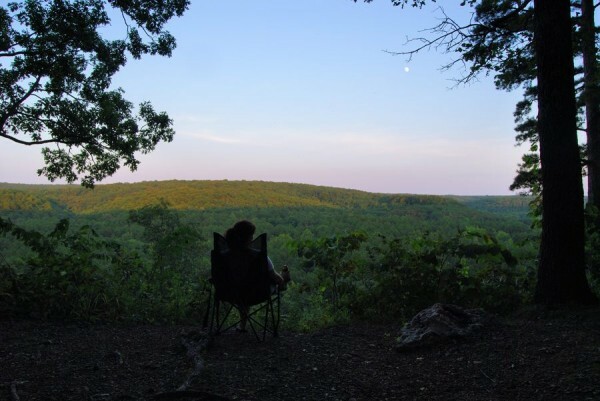 This loop has two camping sites on the edge of a 140 ft. bluff with wonderful views overlooking Huzzah Creek and the Huzzah valley. Due to the drop off, this part of the campground is not recommended for families with young children or sleepwalkers. The only disadvantage of these sites is the stream of vehicles coming round the loop to take in the view. Loops 4. 2 Lower loops, 1 group camping area and the Pines Overlook. Payment Cash or check in an envelope provided at the self serve pay station. Amenities Access to Huzzah creek for swimming etc. Camp hosts can supply fire wood. Visit the near-by Dillard Mill. It’s difficult to believe that the red coloring is just the result of staining from the top layers of rock. Whatever the cause, the result is very impressive. This loop of the campground seems to suffer the most from flooding. The camp hosts are quick to get it cleared up again. These modern vault toilets are very clean and well maintained. There used to be a campsite on the left, but the creek bank has eroded leaving just a short bit of the driveway. The above picture gives an idea of why it’s not a good idea to have young children, or too many drinks at the Pines Overlook campsites. It quickly drops the 140 ft. to Huzzah Creek. There is no guard rail. While you are in the area Dillard Mill is well worth a visit. Google street view showing Davisville, unfortunately the Street View car stopped here. 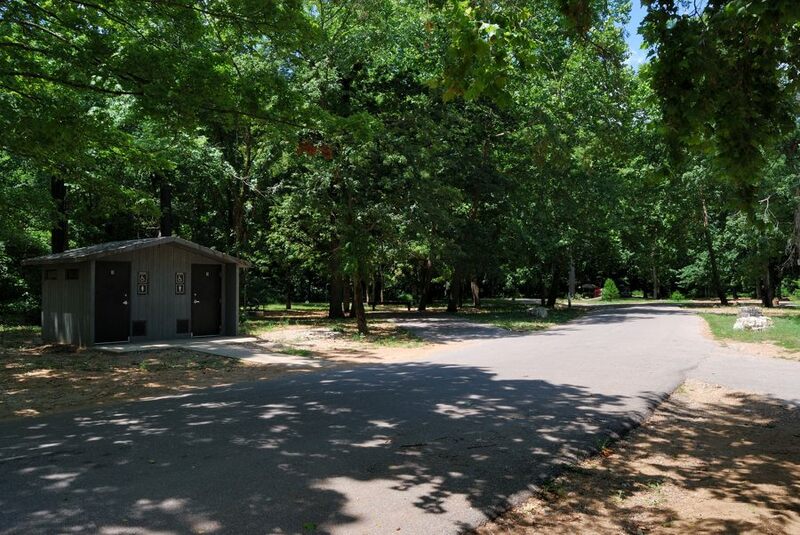 The entrance to Red Bluff Campground is about a mile further on up the hill on the left..